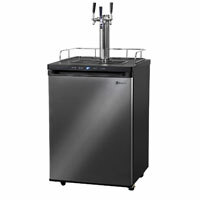 These models are designed with an elegant black stainless steel door that looks great in any setting as it reflects light back into the space, creating a spacious and inviting feeling. 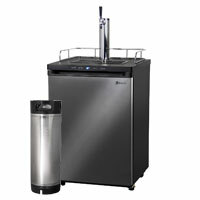 While standard stainless steel is easily smudged and requires special polish to keep it looking new, black stainless steel has a unique black-graphite tone that helps guard against scratches and fingerprints. 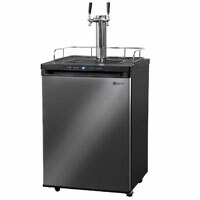 Cleaning is as easy as using a damp cloth followed by a soft towel. 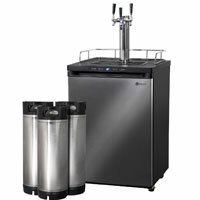 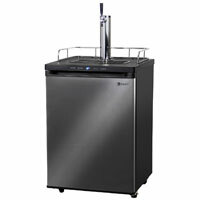 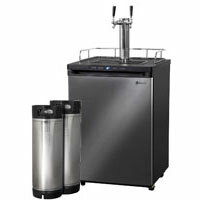 These Kegco digital kegerators have the widest temperature range available so they're cold enough to serve ice-cold beer and warm enough to dispense wine at the right temperature. Whether you're looking for a kegerator to dispense store-bought beer, homebrew, kombucha or cold-brew coffee, you're sure to find a configuration that suits your needs.